The engine controller M2500 has been designed for control, monitoring and protection of engines in marine applications e.g. auxiliary generators, emergency generators, harbour generators or engines for propulsion. Despite that the M2500 have been designed to meet the strictest requirements for marine, the M2500 is also the premiere choice for engines in land applications. 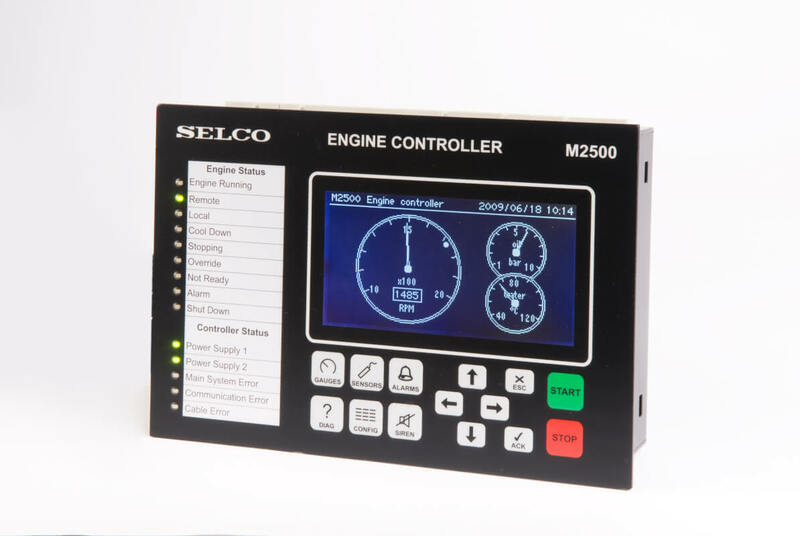 Few engine controllers provide as intuitive a user interface as the M2500. The M2500 provides all necessary inputs and outputs on-board, which means that no auxiliary I/O modules are required. Given the fact the M2500 supports both discrete sensors (potential free contacts or 4-20 mA sensors) and SAE CAN J1939, the M2500 works just as well with new as well as older engines. RS485 MODBUS RTU is provided for communication with SCADA or HMI systems. The unit allows manual (local) and remote (automatic) start of the engine and will monitor all relevant engine parameters – either through discrete sensors or through SAE CAN J1939. 9 digital and 8 analogue inputs (with cable monitoring) are provided on-board for detection of alarms and/or shut down conditions. A total of 90 alarms can be configured. Each alarm can be configured for either monitoring or engine shut down. 12 programmable output relays are available. The relay outputs can be configured for common warning, alarm or shut down. Additionally there are pre-defined outputs for common alarms, shut downs and status indication. Everything is provided on-board in a single flush mounted panel. There is no need for auxiliary I/O boards etc.